At Sirens, we’re committed to keeping the cost of attending as low as possible for all attendees—and making up the resulting budget gap in a number of other ways! And our annual auction is, by far, the most effective way we have of closing that gap. Each year, the Sirens auction—a true community effort—raises approximately 25% of the cost of presenting Sirens. As in past years, our auction will feature hundreds of items made available one of three ways: Fun, quirky, and relatively inexpensive items—such as geeky make-up, costume elements like wigs or masks, certain jewelry—are made available as part of our buy-it-now auction throughout the conference in our community room. 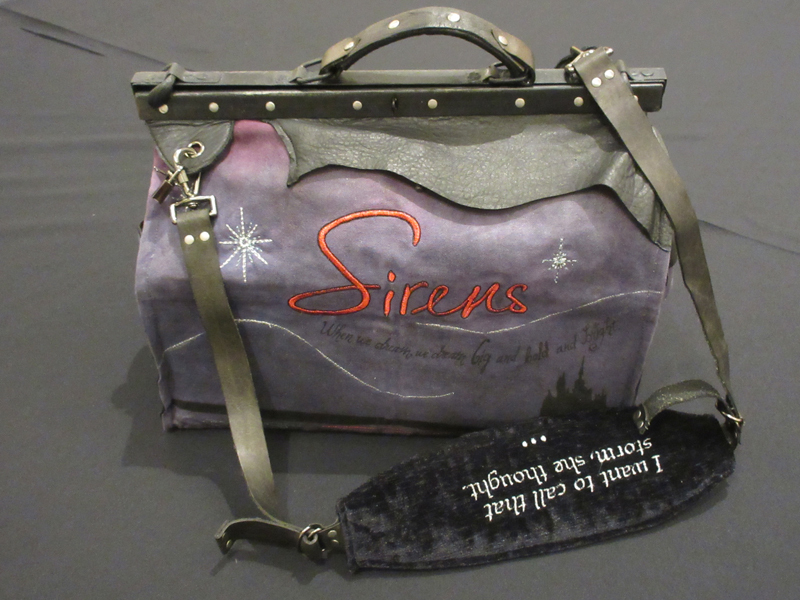 Mid-priced items—such as advance reader copies, original artwork, or certain hand-crafted items—are included in our silent auction during the Sirens Ball. And truly rare, unique, or valuable items—which can go for a couple hundred to over a thousand dollars—are auctioned off live during our Sunday breakfast. We hope that you’ll consider donating an auction item or two—and buying an auction item or two. If you’d like to donate, or you’d like some advice on what might be a helpful auction donation, please write us at (donate at sirensconference.org). Donate Auction Items: Many members of our community spend time each year sourcing or crafting unusual, unique, original, or just plain fun items for our auction. You might embroider our logo on a bag or craft an original quilt. You might share your expertise to help someone revise a manuscript or draft a query letter. You might donate a rare bottle of whiskey, a box full of adventure, or geeky makeup that you found in your travels. 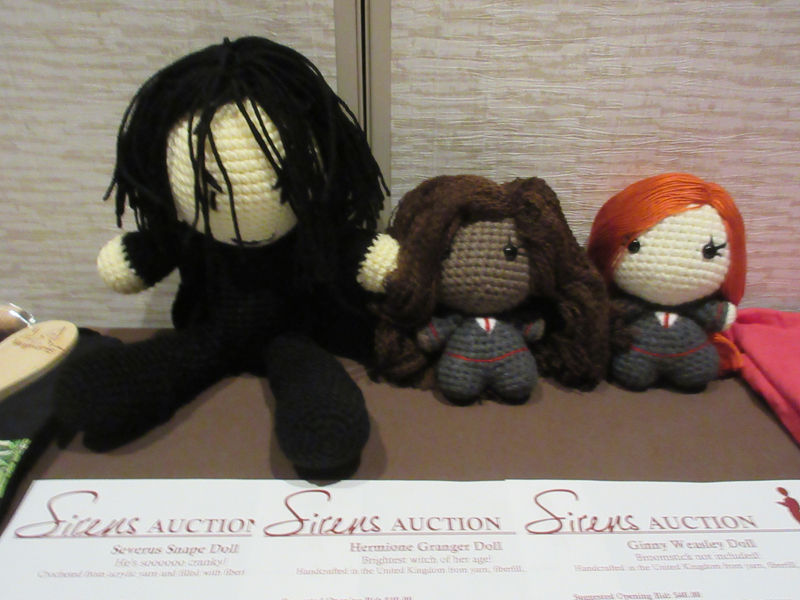 Purchase Auction Items: If you attend Sirens, we hope you’ll spend some time perusing our auction offerings. We’ll have new buy-it-now items available frequently during the conference, so stop by the community room regularly. 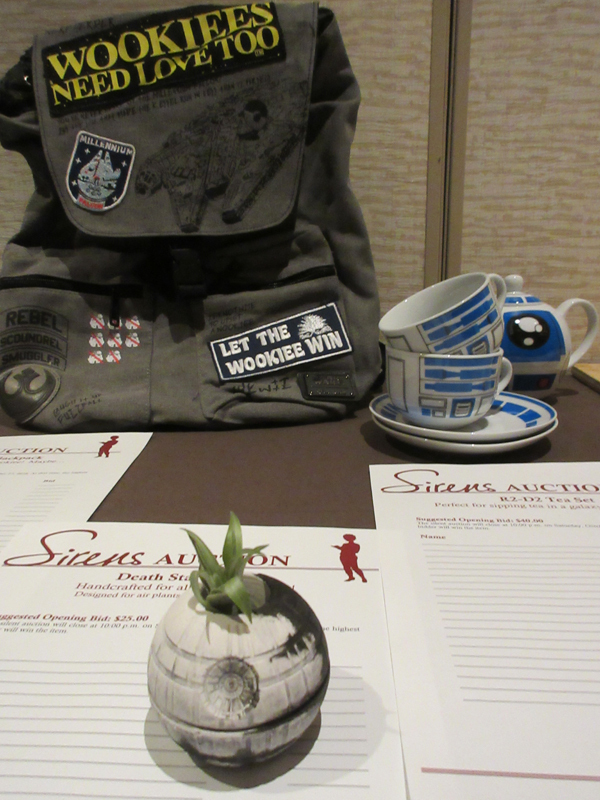 Take a few minutes during the Sirens Ball to bid on an item or two. And get up in time to perhaps bid on something amazing during the live auction Sunday morning. Past winners have even been known to pay us more than their winning bid! Geeky Items: Whether you’re into Black Panther, Star Wars, Harry Potter, or Game of Thrones, we’ve got you covered. From Honeydukes cocoa mugs to ladies of Wakanda wood carvings to Rose and Paige Tico matching necklaces, we’ll have fun and unusual items available. Feminist Items: From feminist socks to “resist” necklaces to charm bracelets with artwork of powerful women, our auction has featured a number of items proudly declaring your feminism. Bedtime Stories Items: Everyone is invited to wear their pajamas for Bedtime Stories, but what if you want to go the extra mile? We might have light-up unicorn slippers or a mermaid robe you might like to buy. Costume Items: Sometimes, you think you aren’t going to dress up for the Sirens Ball, but then you want to after all. It’s not too late! Grab a mask, some cat ears, or a set of steampunk goggles and you’ll be on your way. Advance Reader Copies: Calling all readers! Our silent auction often features sets of advance reader copies, those coveted pre-publication versions of upcoming fantasy releases. Clothing: Perhaps a Jedi robe or a galactic kimono, a silk scarf suitable for Elvish royalty or a travelers’ cloak. Or perhaps someone will offer to create something original just for you. 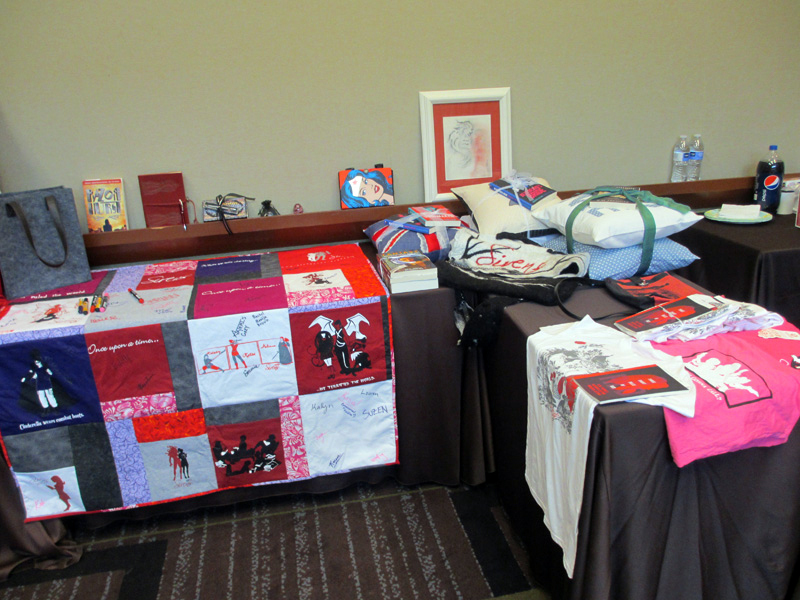 Crafts and Artwork: Custom quilts, crocheted afghans, embroidered pillows, original artwork, and most famously, a handcrafted, one-of-a-kind bag based on the annual Sirens theme created by Erynn Moss, an every-year Sirens attendee.